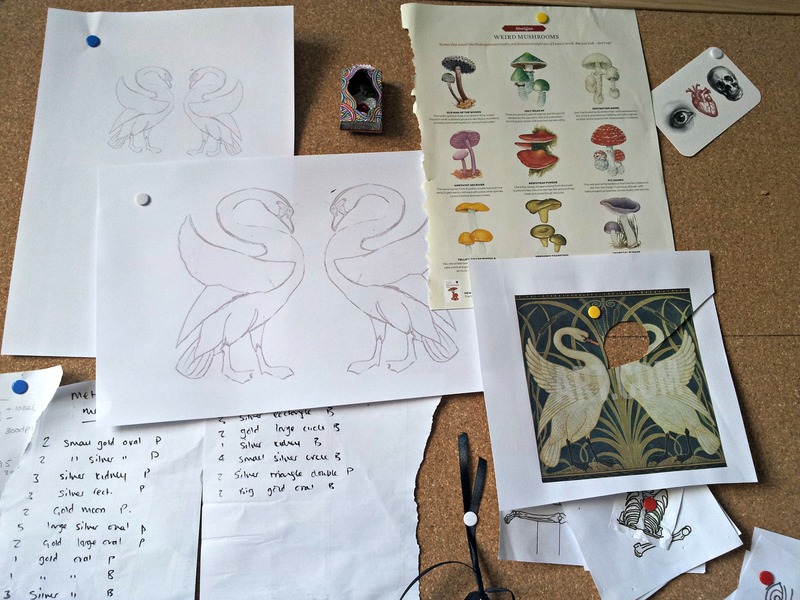 So my pinboard which I usually use for damp-stretching my finished work has been taken over by swans (and toadstools). 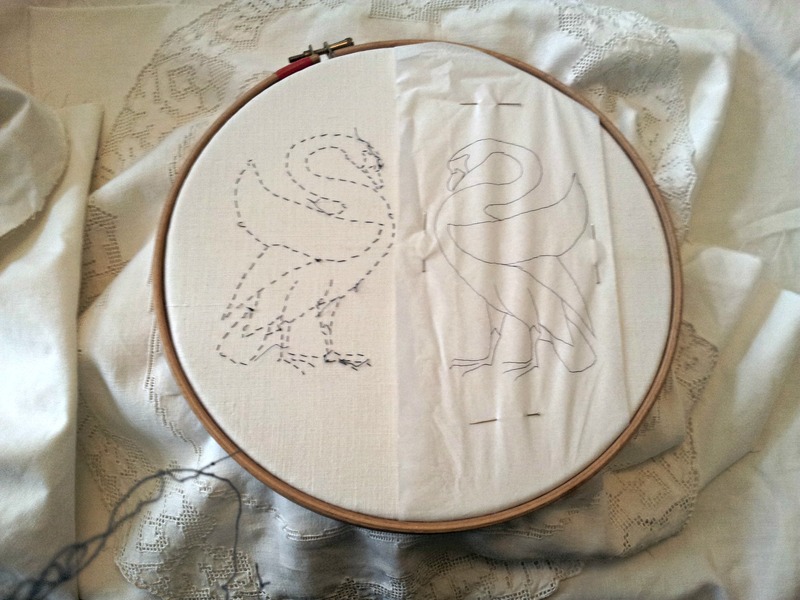 Progressing with the pattern transfer. This was a lesson in trusting one’s instincts versus trusting one’s ruler. It was a draw. 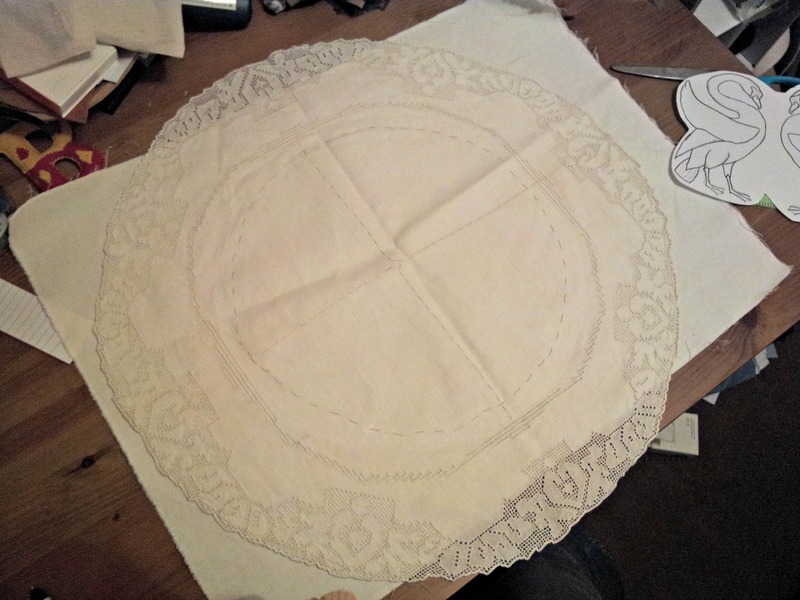 Here is my prepared piece; you can see the backing cotton under the doily with tacked centre lines and circular lines attaching both together. 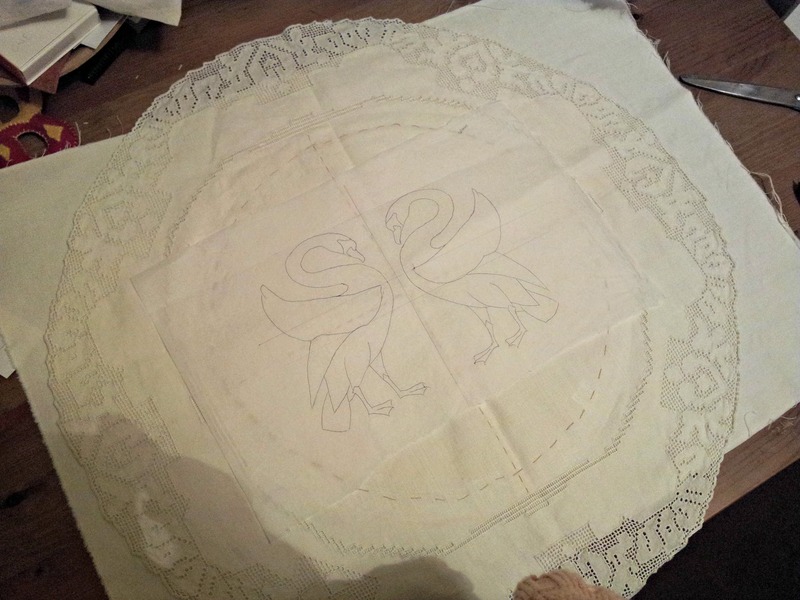 On goes the tissue paper pattern and I line up the centre lines. Here’s the start of my problems. Because I had tacked the two fabrics together in a rough circle, it was fooling my eyes into not seeing the actual circularity (real word?) of the doily. 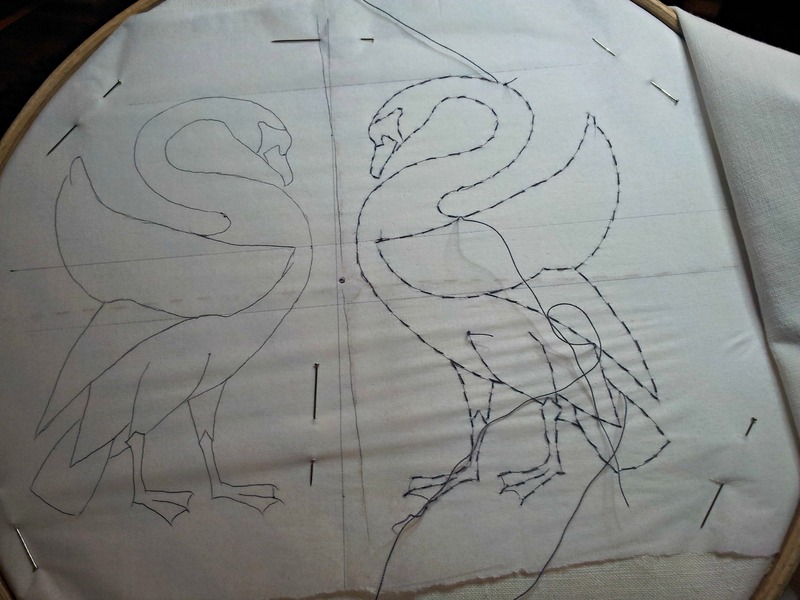 So I started not trusting the position of the swans when lining up the centre line. Out came the ruler. Slight adjustments were made. I pinned. I hooped. 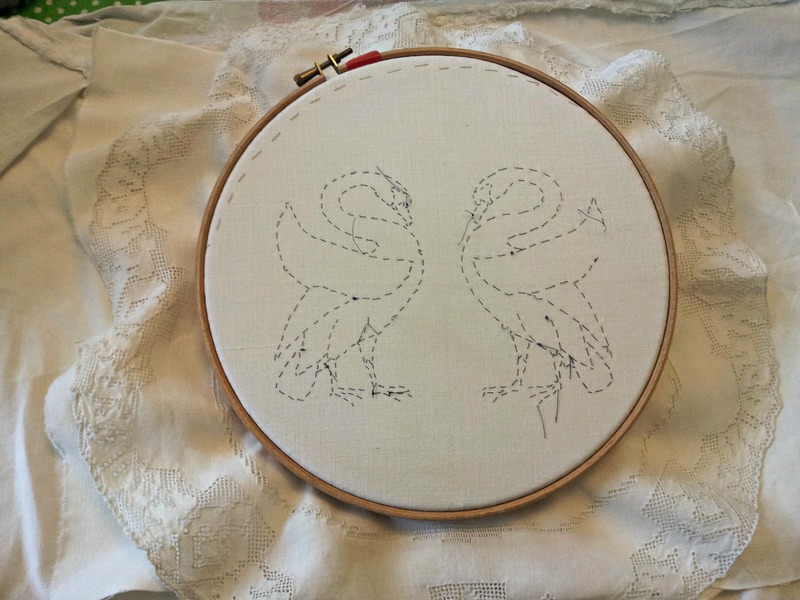 Here I have used bog-standard sewing thread to running-stitch around the whole thing. 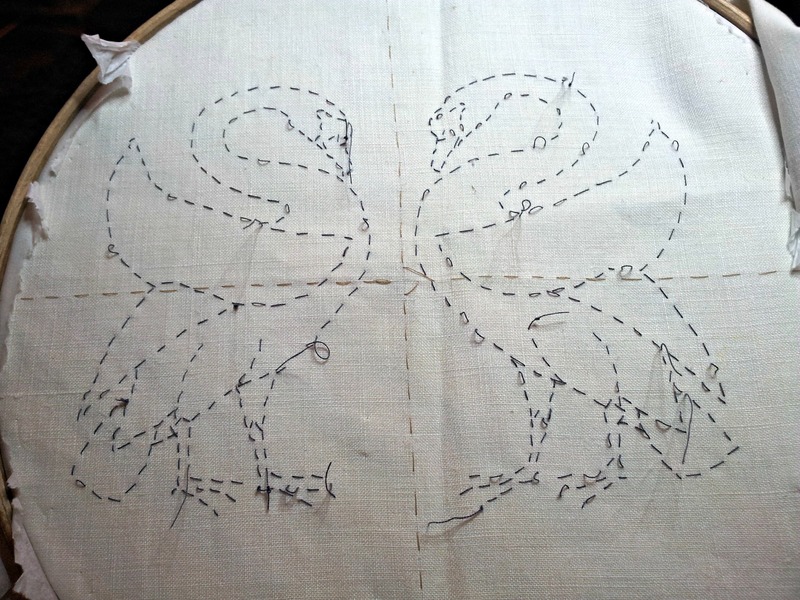 It’s important to properly stab-stitch – insert the needle at right angles to the fabric, not at a slant otherwise the pattern goes a bit wonky. 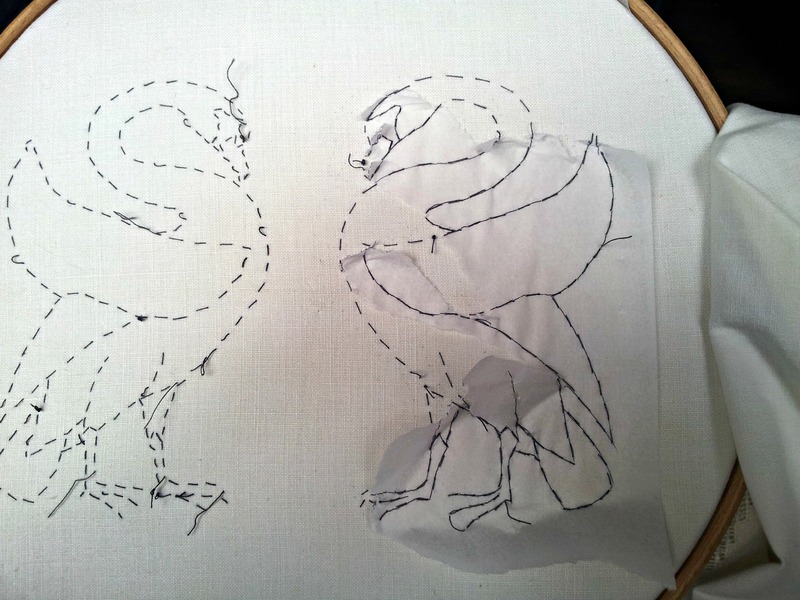 Then the bit you think will be fun but isn’t – rip out the tissue leaving the stitched outline. You can easily see how the pattern is off centre at this point. However I was unconvinced the centre line was truly central. Until I unhooped and looked at the whole thing and realised it was definitely wonky. Sigh. Out came the ruler again. I realised the problem. 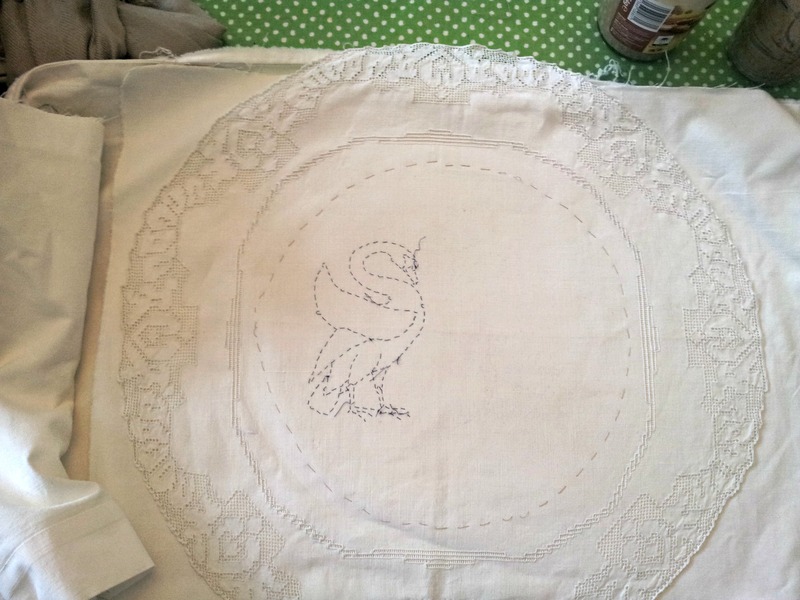 Because the doily is handmade, we are not working with a perfectly symmetrical canvas in the first place. 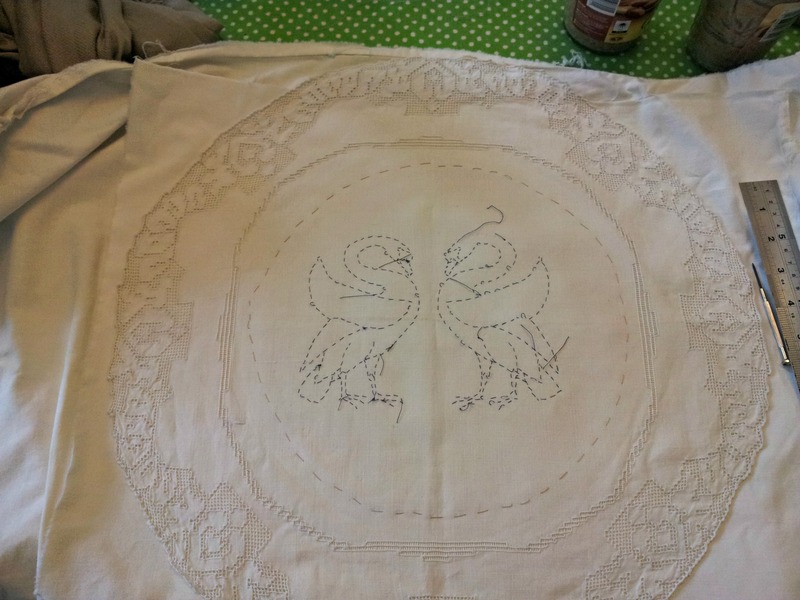 The cutwork is different on one side to the other, and I failed to spot this so measured from what I thought was a mirror image spot on each side. And obviously my tacking lines weren’t helping my judgement. Squinting ensues. I have an internal battle between my laziness and my perfectionism. Perfectionism, of course, wins. 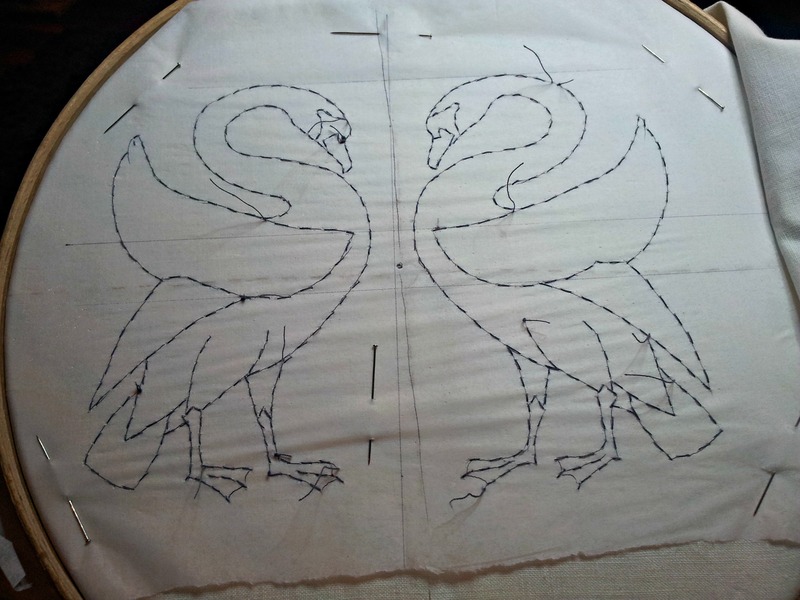 I pull out the right swan and start again. So the thing to realise with this is, the whole thing is a hand-work of art; so there are no nice factory-made straight edges to work off – it ultimately has come down to artistic judgement and I just have to trust myself. I’ve done the maths. This is now perfect. The hard bit is over. 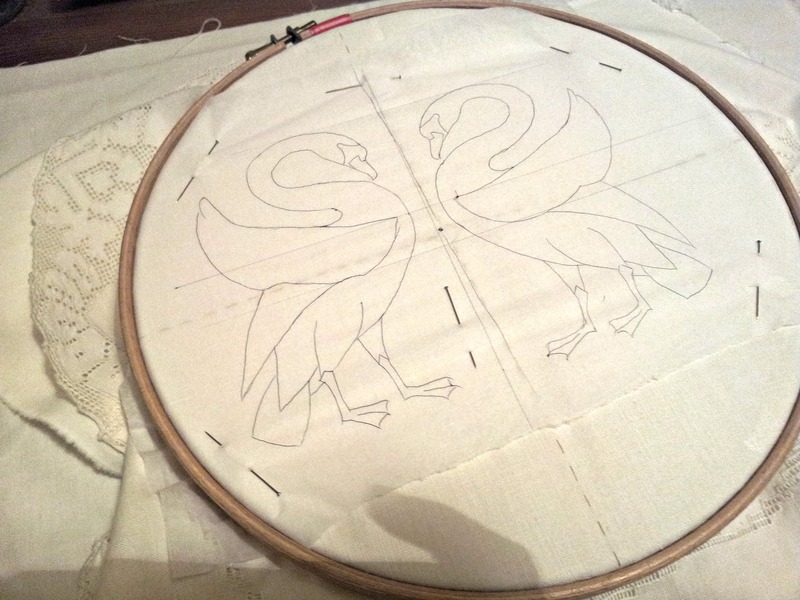 I am hooped up and ready; tomorrow starts a 3-day embroidery marathon!